Occasionally it turns out nearly everyone’s wrong. Fortunately, I’m here with a spreadsheet to put us all right, like some kind of irritatingly pedantic superhero. Last week, Osborne’s Budget revolutionised pensions. Immediately, the Tories narrowed the gap on Labour from around 4-5pts to around to 1-2pts. The Tories’ poll boost was the product of a careful plan to target pensioners who’d switched to Ukip. Older people not only vote far more than young people, but they’re also Ukip’s strongest group, so are crucial for the Tories to regain. The growth in the Tories’ support reflected their focus on winning back their older former voters – and the success of that plan. The odd thing is, this is not only untrue, it’s actually the opposite of what happened. 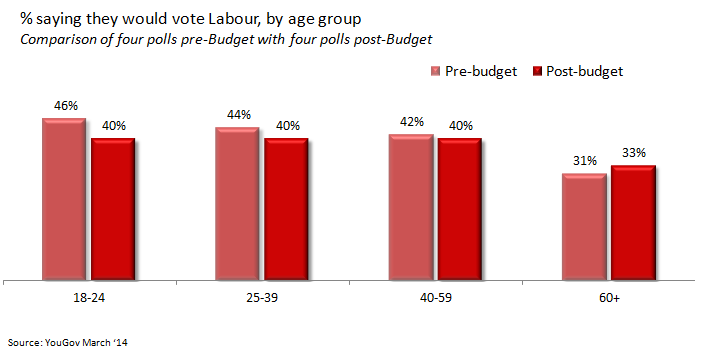 The Tories didn’t gain ground among over 60s after the Budget: Labour did. 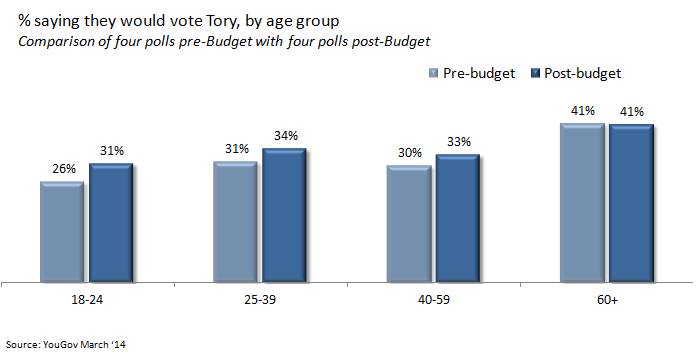 The age group that the Budget swung most towards the Tories was the under 25s. This may be the most surprising poll result I’ve ever seen. On the basis of the useful polling heuristic that anything interesting is probably wrong – Twyman’s Law – I’ve checked it with 8 YouGov polls (4 before the Budget, 4 after); 3 Populus polls (2 before, 1 after); and 2 Survation polls. They broadly tell the same story: since the Budget, the Tories have gained ground among younger people and Labour have held steady, or even won support, among older people. I can see some logic for why people who’re already retired wouldn’t love the Budget. The pension changes help people who’re yet to retire, doing nothing for those who’re already retired. Still. Firstly I’m surprised that the result has been an increase – at least relatively – in Labour’s support among older people (why would it? what have Labour done this week to earn it?). And secondly, I’m amazed that there’s been such a change among under-25s (how many of them are thinking about their retirement?). The reality may be that these changes aren’t actually the result of rational policy calculation in response to the pension changes. Perhaps they’re more about the feeling people have had from the Tories projecting a sense of direction and accomplishment. I would also expect them to unwind within another week. But it’s a reminder that the (near*) universal opinion about what’s going on in politics is sometimes completely wrong. * It would be unfair not to point out that Survation did make this point earlier this week. It didn’t seem to have stopped everyone else getting it wrong. This entry was posted on Thursday, March 27th, 2014 at 23:37	and is filed under Politics. You can follow any responses to this entry through the RSS 2.0 feed. Both comments and pings are currently closed.